Last week we spent a few days in LA to shop and eat and check out a new museum. My daughter did a little research to find a lunch spot in Brentwood/Santa Monica. We were more than delighted with her find. Lemonade turned out to be the perfect place for a quick, inexpensive, but delicious lunch. They serve cafeteria style, but don't let that scare you away. They have so many healthy salads to choose from. We went with a spicy kale and cucumber salad and one with red quinoa. We also each had a small side of white truffle macaroni and cheese. Yum! We had guests this weekend and I overheard my daughter describing the food. She said the macaroni and cheese was prepared stove top and not baked. Gosh, hard to believe she's only 17! We chose a blood orange lemonade and a watermelon rosemary. Worth a stop just for the lemonade...oh and they have amazing desserts. Vancouver Art Gallery has a great cafeteria as does The Getty...north of L.A.
the travertine and the art are wonderful too! Sounds like such a fun day! I just had blood orange lemonade for the first time this weekend and it's amazing. It must be the new thing! Spicy kale and cucumber salad with red quinoa, hmmm, I might have to make that up as I am obsessed with kale. Isn't it funny how kale is being served everywhere now? Every restaurant I go to has some sort of kale salad on their menu. That wasn't the case 6 months ago, or maybe I never noticed it before because I wasn't a fan until recently. BTW, I love what Elizabeth did with my blog. I am hiring her for more. She is top notch! Yum, looks delicious for a quick lunch with friends! The lemonade looks great too! This looks sooo good! great find! I am bookmarking this post in my travel folders in case I get out that way soon. What a sweet looking place! 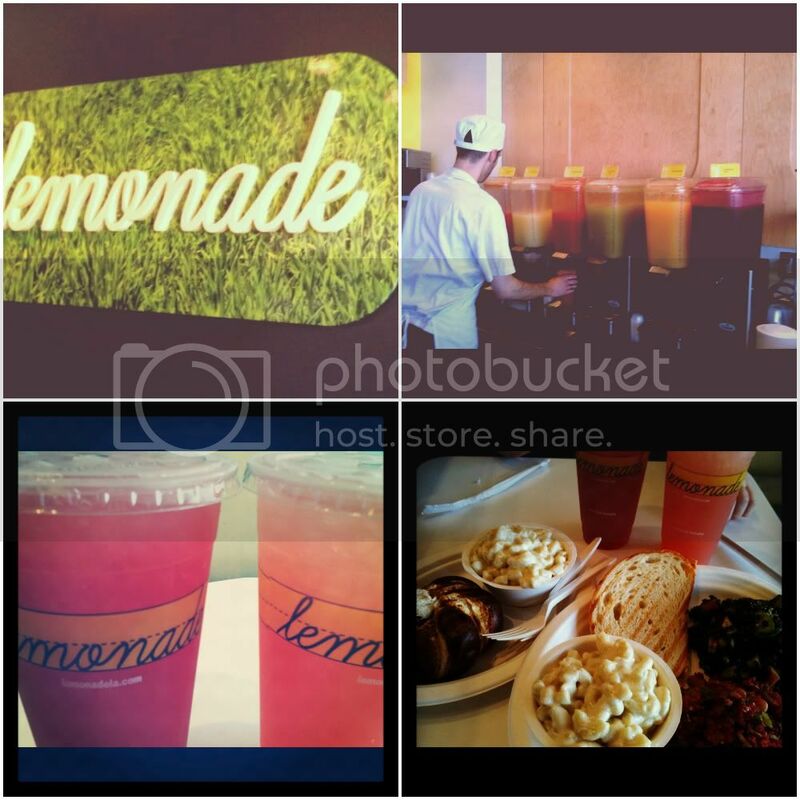 I love those lemonade cups!! Thanks for the tip about this on my blog. Loving all the fun places to eat while I am here. I am going to try to get to Lemonade tomorrow, my last day. Love unique places like this. Can't wait to try the watermelon rosemary. Yum! Annie, With your recommendation, Jeff and I went to Lemonade over the weekend...twice! I got the Ginger Peach lemonade and it was so good! If you make it back...try the Lemon Macaroon. They are huge so you can split it between two.